When the first Mario + Rabbids: Kingdom Battle images started leaking this last May they were not well-received – and that’s putting it lightly. 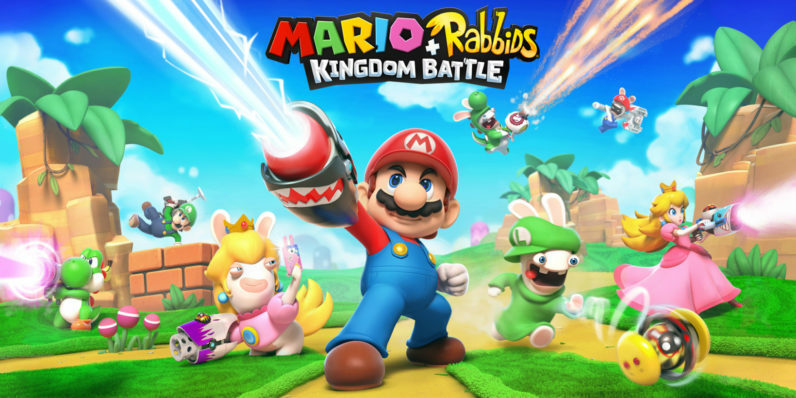 The crossover between Nintendo’s beloved Mario universe and Ubisoft’s Rabbids (think Minions but dumber) was not something anyone had asked for, and the actual content of the leaked images made it all even worse. Once the internet was done bemoaning the fact that their beloved Mario universe was being invaded by Ubisoft’s off-brand Minions, public opinion slowly shifted to a more favorable level. When Mario + Rabbids was revealed at Ubisoft’s E3 keynote you could almost feel everyone’s nerd heart warming up to the idea of a turn-based, tactical Mario game. One friend of mine (who attended) even told me that it was his personal surprise of the show, over titles like the highly anticipated Super Mario Odyssey. Looks like Ubisoft’s plan came together. Mario + Rabbids: Kingdom Battle is out now and it comes at the right time: Right in the middle of the summer-drought that happens every year after the last games of the spring come out and before the new Madden sees the light of day at the end of August. There’s not a lot to play on the Nintendo Switch at the moment (unless you are a filthy Sonic fan) and Super Mario Odyssey isn’t out until the end of October. So yes, it’s the right time and I’m happy to tell you that it’s the right game too. Anyone who’s ever played a game like XCOM or Fire Emblem will feel right at home with Mario + Rabbids. It’s a turn-based strategy game that dabbles in all the tropes of the genre, with a few minor twists here and there. You control a team of three characters (Mario + 2 interchangeable buddies) and every turn you move them around within a set range, fire your gun once, and maybe pop one of your special abilities. Your turn is over after you’ve done this with all of your team members, which means the enemies (evil rabbids) get to do the same. Rinse, repeat. The biggest difference between Mario + Rabbids and a game like XCOM is the ability to use your teammates as jumping pads. If you move your character to a tile that a teammate is on, you’ll get to launch yourself from that tile to another one further away. This sounds pretty minor, but it has you constantly thinking about your team’s positions on the battlefield, as you leapfrog around enemies to flank them. This mechanic is fun as hell and drastically changes the way you go about the combat situations. When Mario + Rabbids was first announced I was just as worried as my peers, but those fears turned out to be unnecessary. Mario + Rabbids is genuinely fun and the Rabbids are not nearly as annoying as I thought they’d be. They actually provide some welcome comic relief and they blend together nicely with the Mario universe. There are some minor qualms I have with some of Ubisoft’s design decisions though. For some reason you only get your health back after every other fight, which means that you’ll sometimes started with a damaged team. That feels like an unfair disadvantage and I’m sure Ubisoft secretly agrees because they tried to remedy it by adding in an ‘Easy Mode’ you can enable before every fight. This ‘mode’ gives you your health back plus 50% extra, but it kinda feels like cheating. Another slight against the game is the lack of variety. Having spent most of my weekend binging it, I got a little bored with the monotony. The pace at which Mario + Rabbids introduces new mechanics, enemies, and characters is on the low side and it becomes obvious when you’re trying to rush through it. The game is probably better suited for short bursts, like during a commute. But don’t get me wrong, I truly adore Mario + Rabbids. It is way more fun than it has any right to be and I can’t wait to jump back in for some more. It plays like a charm, looks gorgeous and it is the perfect game to hold over any Switch owner until Super Mario Odyssey comes out.